I have been searching a long time for the best bakery style chocolate chip cookie recipe. I think I have finally found it. Even hubby (who is more of a oatmeal cookie kind of guy) said these were "really good cookies". I found the recipe here at Sugar and Soul Co. These cookies come out soft and chewy. They had great flavor with tons of chocolate chips in each bite. The recipe was easy to make, had no "secret ingredient" (that you have to order from Amazon cuz your Krogers doesn't carry weird stuff) and made 12 really huge cookies. Only 12 cookies! I am sure you are saying that will not last long at your house! But take my word for it, these cookies are ginormous. 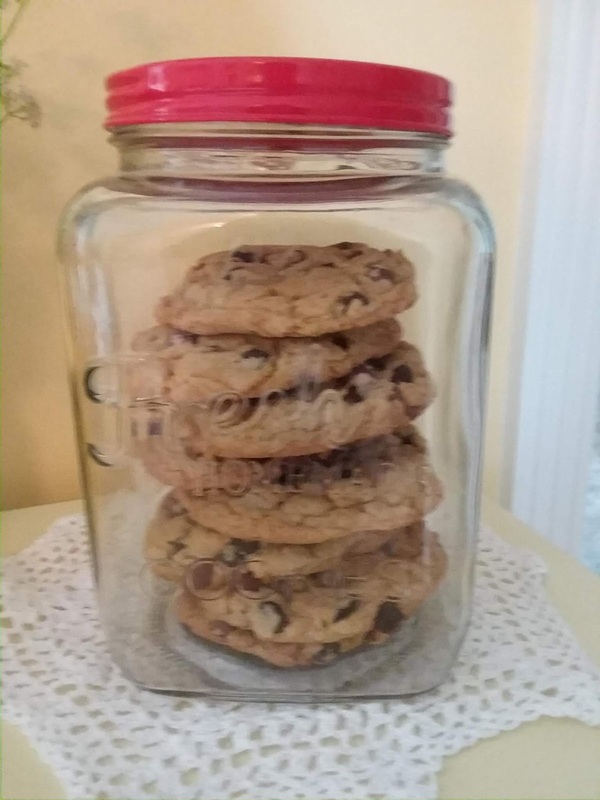 I couldn't even fit them all in my large cookie jar. 12 cookies will be enough. Seriously, I refuse to believe you will be able eat more than one. 3/4 cup (1 1/2 sticks) unsalted butter, melted *Do not use soften butter!!!! You must melt it!!! Cream together melted butter and sugars in a large bowl or stand mixer fitted with a paddle attachment. Add in the vanilla, egg, and egg yolk and beat until light and creamy. In a separate, medium bowl, whisk together the flour, baking soda, and salt. Add the flour mixture to the wet ingredients a little at a time, mixing between each addition. Fold in chocolate chips with a wooden spoon. Preheat oven to 325­­°F and measure dough into 1/4 cup-sized balls (I used an ice cream scoop), place balls on an ungreased cookie sheet at least 3 inches apart (I lined my pan with parchment paper). Bake for 15 to 17 minutes until the edges are golden brown. Let the cookies cool on the pan. Here are some Recipe Notes that Sugar and Soul Co. shared on her site. It is crucial that the cookie dough is chilled for at least 1 hour so that the cookies will be thick and chewy. It's also very important that the cookies are allowed to cool on the pan for at least 15 minutes after coming out of the oven. ***I followed the recipe very carefully. Well almost. I didn't have unsalted butter so I just reduced the additional salt from 1/2 to 1/4 teaspoon. Seemed to be about right. Cookies tasted great!!! !